﻿ Maison Ambre Guesthouse, Windhoek | FROM $55 - SAVE ON AGODA! "Maison Ambre is conveniently located within safe walking dis..."
Have a question for Maison Ambre Guesthouse? "The compound is very secure and the villa/guest house is very comfortable." "The owners gave us very good recommendations for restaurants for dinner within walking distance." 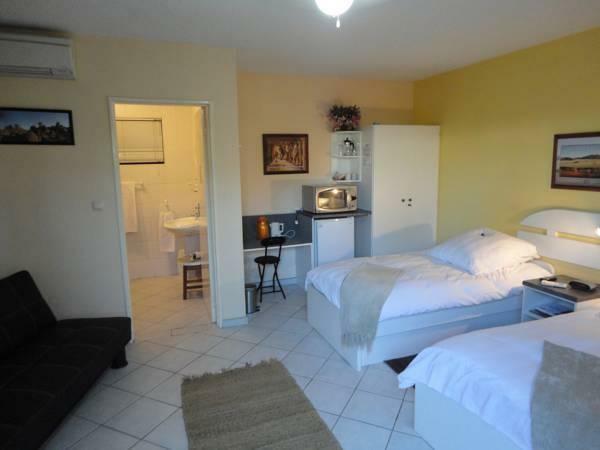 "On arrival we were met by the owners and shown to our wonder..."
Renovated in 2012, the Maison Ambre Guesthouse guarantees guests a pleasant stay whether in Windhoek for business or pleasure. The hotel is not too far from the city center: just 2.0 Km away, and it normally takes about 30 minutes to reach the airport. For sightseeing options and local attractions, one need not look far as the hotel enjoys close proximity to Schwerinsburg Castle, Sanderburg Castle, Maerua Mall. Offering hotel guests superior services and a broad range of amenities, Maison Ambre Guesthouse is committed to ensuring that your stay is as comfortable as possible. The hotel offers access to a vast array of services, including free Wi-Fi in all rooms, Wi-Fi in public areas, car park, airport transfer, laundry service. Guests can choose from 6 rooms, all of which exude an atmosphere of total peace and harmony. The hotel offers an excellent variety of recreational facilities, including outdoor pool, garden. With an ideal location and facilities to match, Maison Ambre Guesthouse hits the spot in many ways. "Nice place, nice staff, nice boss and nice breakfast , recom..."